The United States is seeing a massive surge in solar energy with more than 130 GW of solar capacity expected to come online over the next five years, as there is a massive pipeline of large utility-scale solar projects set to be installed across the country. This is no surprise given that solar energy has become the cheapest fuel to power generation plants not only in the USA but most countries across the world. Finding solar prices at 2-3 cents/kWh is no longer a surprise with costs trending lower and lower each year. Even with the duties put on imports of solar panels from China, solar prices in the USA are going lower as solar panel costs are expected to fall another 20%, driven by growing global supply and improving technology. Though solar panel prices are almost 20-30% higher than global prices, the overall solar energy costs are becoming cheaper than coal and gas. This has made project developers line up to build massive amounts of utility-scale farms across the length and breadth of USA. While most of the 34 GW of existing solar capacity in the USA is concentrated in a few states such as California and Arizona, the pipeline is spread across the USA and all the six major electrical grids. The falling costs of storage in the form of lithium batteries is further boosting the prospects of solar energy as it is negating the only Achilles Heel of solar energy in the form of its intermittency. Solar plus storage costs are already touching 5 cents/Kwh in certain situations which means they are giving natural gas plants a run for the money. Given the falling costs of both solar and storage, no investor worth his salt is willing to invest in natural gas power plants anymore. This had led to huge distress in the natural gas supply chain which serves the power industry. GE and Siemens which used to generate billions of dollars through sales of natural gas turbines are seeing losses in that segment. The peaker plants using natural gas are seeing alternatives in the form of solar plus lithium battery storage plants. In some situations such as island solar plus storage can be almost half the price of the existing diesel power plants. The other driving factor is the green quotient of solar power. Though the Trump administration has backed away from its climate change commitments, many states and cities are still driving regulation and policy to increase green power to mitigate climate change effects of fossil fuels. Coal-based power plants in the USA got killed by clean gas power plants. 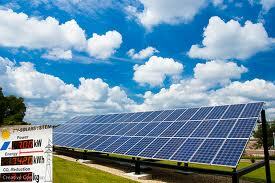 Now natural gas power plants are getting cleaned up by the even cleaner solar energy power plants.